A flying wing aircraft design resembling a ninja star can turn 90 degrees in midair to go into supersonic mode. An aircraft that resembles a four-point ninja star could go into supersonic mode by simply turning 90 degrees in midair. The unusual "flying wing" concept has won $100,000 in NASA funding to trying becoming a reality for future passenger jet travel. 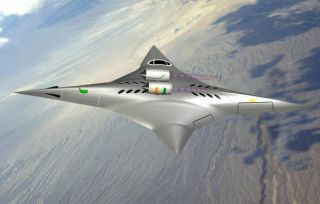 The supersonic, bidirectional flying wing idea comes from a team headed by Ge-Cheng Zha, an aerospace engineer at the University of Miami, and inlcuding collaborators from Florida State University. He said the fuel-efficient aircraft could reach supersonic speeds without the thunderclap sound produced by a sonic boom — a major factor that previously limited where the supersonic Concorde passenger jet could fly over populated land masses. "I am hoping to develop an environmentally friendly and economically viable airplane for supersonic civil transport in the next 20 to 30 years," Zha said. "Imagine flying from New York to Tokyo in four hours instead of 15 hours." The midair transformation allows the aircraft to fly in its most fuel-efficient modes at both subsonic and supersonic speeds, Zha explained. Jet engines located on top of the aircraft in concept illustrations appear to rotate independently of the aircraft so that they can always point forward in flight. Such midair spinning might sound unpleasant for people riding the aircraft. But a five-second rotation would only cause pilots and passengers to experience a "g-force" just one-tenth the force of gravity — less than what airline passengers experience during takeoff. NASA liked the idea enough to give Zha and his colleagues a $100,000 grant from the Innovative Advanced Concepts program. But the U.S. space agency does not expect such funded concepts to fly for at least another 20 years or so. "We are inventing the ways in which next-generation aircraft and spacecraft will change the world and inspiring Americans to take bold steps," said Michael Gazarik, director of NASA's Space Technology Program. The bidirectional flying wing aircraft could also lead to the first supersonic drones soaring over the U.S. homeland or distant battlefields. Zha previously pitched the robotic military version to the U.S. Air Force at an unmanned aerial systems conference in 2009. Both the U.S. government and aircraft manufacturers also have begun pushing for hypersonic aircraft capable of flying more than five times the speed of sound (Mach 5). Aerospace giant EADS displayed one passenger jet concept at the Paris Air Show in 2011, but aviation experts suggested a ticket to board the flight would cost at least $10,000. The U.S. has already begun carrying out tests of unmanned hypersonic aircraft, but with mixed results. A U.S. Air Force test of the unmanned X-51A WaveRider ended prematurely when the aircraft plunged into the Pacific Ocean on Aug. 14. Editor's Note: The original version of this story mistakenly said that Ge-Cheng Zha is an aerospace engineer at Florida State University. He is an aerospace engineer at the University of Miami.